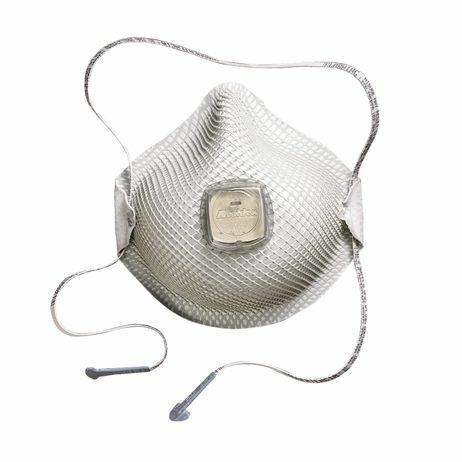 Moldex® 2700 N95 Particulate Respirator With HandyStrap® & Ventex® Valve – Medium/Large Hangs Loose! HandyStrap® allows mask to conveniently hang down around the user's neck so its always ready for use. Helps prevent premature disposal of the mask. And during wear the adjustable cloth strap feels comfortable and cool. Vent Hot Air, Stay Cooler. Exclusive Ventex® valve lets the hot air out faster so breathing resistance is reduced and workers stay cooler. Soft Foam Nose Cushion. Easier to wear and more all-day comfort for more of the work force. Helps eliminate pressure points. And without a metal noseband to continually adjust. Dura-Mesh® Shell Lasts Longer. The exclusive Dura-Mesh® shell protects the filter media so it stays cleaner looking longer. 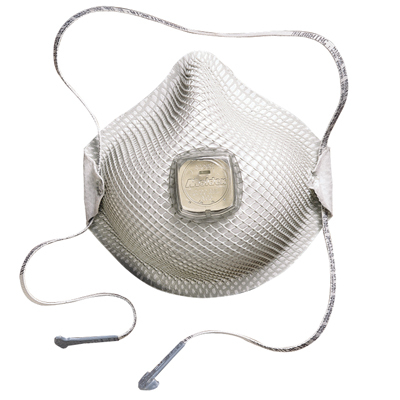 The shell also resists collapsing in hot, humid environments so the respirator holds its shape longer. The result is fewer respirators used and lower costs. Applications Hot, humid and dusty environments such as welding, soldering and brazing, grinding, sanding, sweeping, bagging, stone quarrying, metal machining, cement, underground mining, polishing, buffing, lime, poultry and textiles. No oils present. Features • 100% PVC-Free. • HandyStrap®, with buckle, allows mask to hang around the user's neck when not in use. • Adjustable cloth HandyStrap feels cool and comfortable. • Ventex® valve lets the hot air out faster so workers breath easier and stay cooler. • Soft foam nose cushion for added comfort and no pressure points. • Dura-Mesh® shell resists collapsing in heat and humidity. • Softspun® lining for increased comfort and durability. • Available in two sizes, for most workers and increased OSHA compliance.